when I was still working in a prepress studio. QuarkXPress 1 and 2 I had never seen. When did you start with QuarkXPress? Do you have interesting splash screens of legacy versions somewhere? Started in QuarkXPress 4.1. I think this version of the best, stable for which released a huge amount of different XTensions. I have experience in this version on the PC and Mac. I will say even more than I did the update, but just bought QuarkXPress 7, and then updated it to the older versions. So I still running the version of QuarkXPress 4.1 and I would gladly use it when there is work for this. Very sorry that QuarkXPress 4.1 is not compatible with OSX. He he, My first version was 2.0, not a good one for design, like Pagemaker, but still more typographic. I worked in Ready Set Go! and Pagemaker, just playing with Quark 2.0. When 3.0 launched the new world opened. Away with the closed boxes!!!! superstyrk wrote: Away with the closed boxes!!!! I even once co-wrote a book for QuarkXPress 4. Remember BOOKS? Just kidding, my last book actually deliberately is only available in Print, no eBook or ePDF. all of 3 Hüglis are like Bibles, special the first one (QXP3) very helpful and impressing. XPress 4.x, like 3.x before it had a lot of XTensions because Quark did not make any of those things an actual part of the program. That was by design of course, but it meant that you had to pay extra for extra things. You're sorry that XPress 4.x was never compatible with OS X. What about the XPress 5.x users who updated only to find out it was OS9? The Quark forums shut down for an entire year because the vocal criticism and outcry over that was extremely toxic. 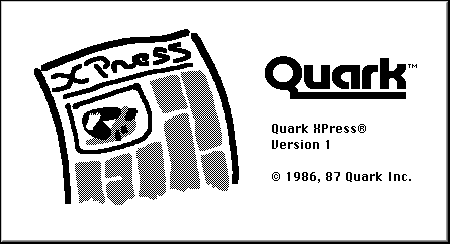 By the time XPress 6.0 came along Quark had ceded the lead to Adobe. And seriously? You'd really want an OS X version of QuarkXPress 4.x? No dropshadows, no PDF import no PDF export, no PSD import, no AI import, no font embedding when exporting EPS, no transparency, no compatibility with Suitcase X1, let alone Fusion, Fusion 2, 3, 4 and 5. You really want to go back to the era of doing all your artwork inside Photoshop and then importing, going back and forth between the two apps to tweak your layout? XPress 10 so far doesn't even offer stroked text! It's still text to box! Don't get me wrong, I am very much pro-QuarkXPress and I am not yelling at you. But seriously, there's been vast improvements since version 4.x. But if you really want to go back to XPress 4, then find a Tiger based PowerPC Mac (an Intel Mac running Tiger won't work) and move a Classic OS9 System folder over to it. You can run XPress on OS X in Classic. Be aware that you will have issues, like font issues and screen redraw issues. Suitcase X1 and Suitcase 10 will work across Classic and OS X. If you're on PC, it will still work under Win7 using compatibility mode. Last edited by eyoungren on 22 Jul 2014, 16:09, edited 4 times in total. Matthias Guenther (Quark) wrote: When did you start with QuarkXPress? Do you have interesting splash screens of legacy versions somewhere? I started in school with XPress 3.03. My first paying job was as an Ad Compositor for the Desert Sun, a daily newspaper owned by Gannett in Palm Springs, California. The DS was using XPress 4.04 on OS9 PowerMacs (not G3s or G4s then) at the time. In 2012, I transferred out to the Indio, California branch and was using XPress 4.11 on a 450mhz G4/PCI, still under OS9. It was that job that had me mercilessly force myself to learn every keyboard command I could. P.S., Matthias, there used to be a splash screen thread around here that I started way back when. Can't find it, so I assume it went bye-bye when we lost that year and a half of posts a few years back. I still have the original handbook of 3.3 version, printed in Romanian! I guess it's a rare item now.